With this next post, we are launching a series of tutorials to show you how Signaturit’s advanced features can help you adapt our solution to your needs. As we had the chance to discuss in our previous post, Signaturit allows for the fastest eSignature request process in the market, with an average 37-minute response time between request and reception. However, most of our clients not only need immediacy but also tools to address more complex signature processes: for example, those requiring several people to sign a document in a particular order, or others in which besides the signature, the petitioner requires other data such as the name and surname of the signer, the date, etc. 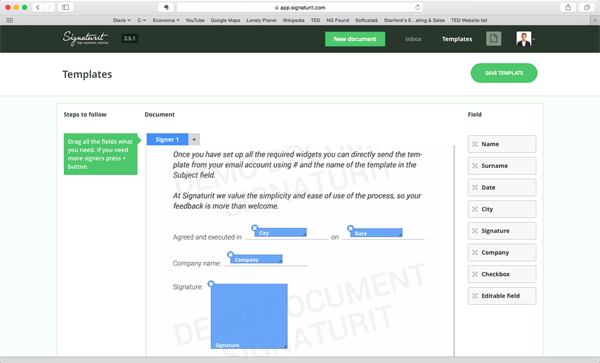 For such typical needs for many companies, Signaturit offers its users a highly versatile and intuitive template feature. Our Personal account users can set up one template, our Pro account users three, and SMB account holders up to five. Both setting up a template and sending it couldn’t be easier. After logging into your control panel by entering your email address and password on our website, you'll see the Templates menu in the top right corner of the screen. By clicking it, you can access the list of templates that you already have and a demo template developed by our team to show you the full potential of this feature. If you click on Add a new template the panel will ask you to drag the PDF document you want to use directly onto the screen, or to browse your computer and select the file by clicking the “Or browse from your PC” button. The next screen offers many possibilities. Above the preview of your document there is a row of tabs that will allow you to assign different fields to different signers (Signer 1, Signer 2, etc.). To the right are the different fields that you can add. The most commonly used, such as Name, Surname and Date, are preset. You can also create your own custom fields by using the Checkbox and Editable field options. However, remember that the label for each field needs to appear in the original PDF document. 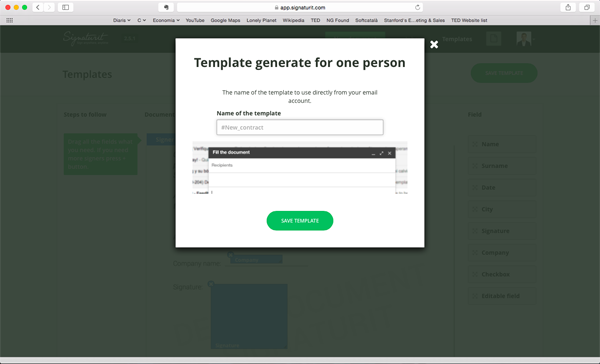 Once you have generated as many tabs and signers as you need, by clicking on the Save template button you will be requested to provide a name for the template. It has to start with a # sign and no spaces between words. Instead, you can use underscores and dashes. 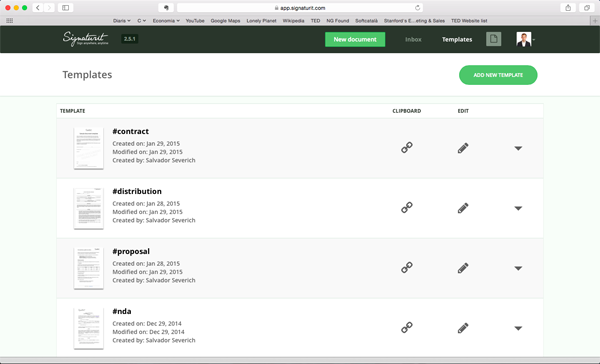 In our example, we will assign the name #contract to our template. Once saved, you can access your template to edit or delete it through the control panel, while the Clipboard icon will copy the name of the template to speed up the request process. In case there is only one signer, simply create a new message using your email client of choice and add ‘signatur.it’ to the end of the recipient’s address (for example: name@server.domain.signatur.it). Write your message and add the name of the template at the end of its subject. 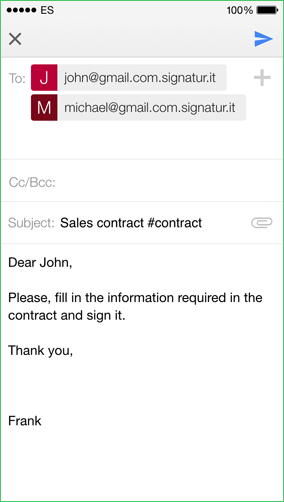 In our example, we will send an email to john@gmail.com.signatur.it saying, “Dear John, Please fill in the information required in the contract and sign it” with the subject: Sales contract #contract. If the template has more than one signer, we will conduct the same process but adding multiple recipients to our message, all of them with the ‘signatur.it’ particle at the end and in the same order we expect them to receive our document (Signer 1, Signer 2, etc.). From here on, Signaturit will handle the rest of the process –usually its most time-intensive and stressful part under the traditional print-scan-send system. We make it fast, simple and compatible with any device: smartphone, tablet, laptop, etc. Each signer will receive an email with the subject and message of your choice, but instead of an attached PDF file it will incorporate an Open document button. By clicking it, each signer will access the document with all its fields highlighted without having to download an app, complete a login process or visit a third-party website. In order to sign it, they will be able to use their fingertips or mouse. Once all the field are completed and the terms and conditions accepted, the process is over and both the solicitor and the signers will receive a copy of the signed PDF document. As you can see, using templates is simple and opens a wide range of possibilities to adapt each document to your specific needs. And don’t forget Signaturit’s compliance with all major eSignature regulations will ensure the full legal validity of the signature and the other fields. In case you need more information about our eSignature solution, please download the free whitepaper below. You can always try Signaturit for free during 14 days, if you would like to try our solution right now. How to create and manage work teams through Signaturit. Multi-factor authentication signature using SMS, picture and audio.